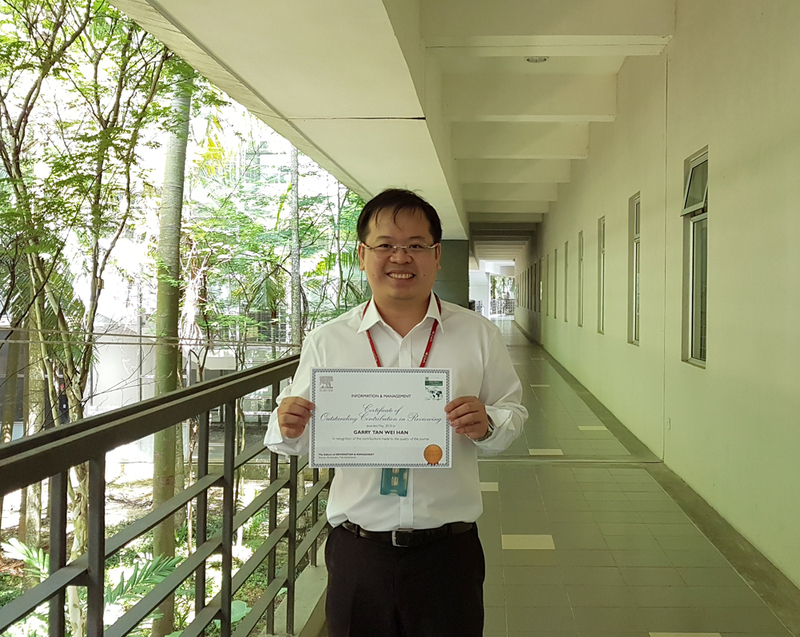 Faculty of Business and Finance senior lecturer Garry Tan Wei Han was recently awarded the “Outstanding Reviewer Award” for Information and Management Journal by Elsevier. He was also listed as the top 10th percentile of reviewers for Information and Management journal, which is a rank A* journal by the Australian Business Deans Council Journal Rankings List May 2018. The journal was also ranked A* by the Australian Council of Professors and Heads of Information Systems. “Reviewing a manuscript requires a great deal of time and dedication. Receiving this award is not only an honour, but also serves as a recognition for all the effort rendered. Additionally, the award also adds to the university’s achievements which are vital for the university to move forward,” said Tan. Inderscience (Switzerland); Journal of Electronic Marketing and Retailing, International Journal of Innovation and Learning, International Journal of Ad Hoc and Ubiquitous Computing, International Journal of Environment and Sustainable Development, International Journal of Mobile Communications, International Journal of Services, Economics and Management. Apart from his current award, Tan also received another "Outstanding Reviewer Award” for the Journal of Industrial Management and Data Systems in the Emerald Literati Network 2016 Awards for Excellence, and was also the recipient of “Publons Peer Review Award" in 2017. The Information and Management Journal is indexed in Thomson Reuters (ISI); Science Citation Index (SCI); Social Sciences Citation Index (SSCI); JCR-2017, IF = 3.89.